A conservative street artist who operates under the moniker Sabo has struck again, this time his target was Democrat Maxine Waters who serves as the U.S. Representative for California's 43rd congressional district. Waters has come under fire recently for comments she made calling for her far-left followers to harass and confront anyone from the Trump administration or its supporters. Apparently, Sabo didn't take to kindly to Waters' comments and decided to compare her to the psychotic killer Michael Myers. Sabo's latest piece utilized a billboard which was advertising for the film "Halloween" featuring the villain Michael Myers but instead of having Myers' horrifying mug on the billboard he replaced it with a portrait of Waters. The replacement of Meyers' head with Waters is quite well done and rather seamless. At first glance, one might even mistake the billboard as being intentional. The mega-sized billboard appears alongside Pico Boulevard in West Hollywood and advertises the latest film from director David Gordon Green. Sabo managed not to deface the billboard, something which would enter the realm of possible criminal prosecution, and simply added Waters' face to the billboard. 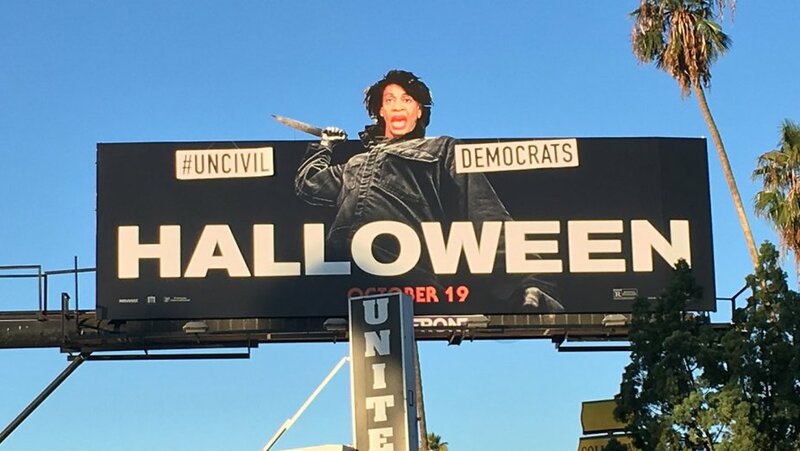 Sabo also added as a final touch the phrase "#Uncivil Democrats". The film "Halloween" is a horror film from Blumhouse and Universal pictures and is a remake of the 1978 classic slasher flick with the same name. Sabo told The Hollywood Reporter that the hashtag he added to the billboard was a reference to when Waters told a crowd of her supporters in June to openly harass and impede the Trump administration at every opportunity, even when they were simply eating with their family or getting gas. "If you see anybody from that Cabinet in a restaurant, in a department store, at a gasoline station, you get out and you create a crowd," Waters said at the Los Angeles rally. "You push back on them and you tell them they're not welcome anymore, anywhere." The call from Waters has resulted in numerous Trump officials being harassed in public. White House Press Secretary Sarah Sanders was even forced out of the restaurant where she was eating. Other people affected by Waters' call to arms have been Texas Sen. Ted Cruz, presidential senior adviser Stephen Miller and Homeland Security Secretary Kirstjen Nielsen. The film "Halloween" is expected to open with a boom this weekend with a domestic box office of around $70 million. Its producers are hopeful the film will set a record for a movie opening during the Halloween month of October.